Shaktipat is a direct experience that brings about awakening of a persons natural spiritual power. Some people, like myself are initiated directly thorough spirit and have to find their own way to self-realisation. This woman describes how Shaktipat was transmitted to her through looking into my eyes. Everyone receives Shaktipat differently. Shaktipat can be transmitted across cities or the other side of the world through the phone. This one received it over the phone. One of my participants felt it while parked in his car as he waited for instruction. Others - as I left the room, they connected with their own energy. Videos are being made of the car park experience. It is unfolding of awareness through guidance of a competent master. This power is within every human being. Events and upbringing have kept it submerged beneath the burden of living unconsciously. A master helps you recognise these energies. Much like a surf lifesaver detects currents in the ocean. A surf lifesaver know the conditions of the ocean. A sailor knows how to read the ocean currents, where an average person cannot. Shaktipat affects every aspect of your life. This woman was initiated by three spirits while I facilitated direction. She came to me wanting to be more complete in her relationship. She shares what these beings told her. Shaktipat cannot be enforced, imposed upon or manipulated. where you see people waving hands over a vibrating body is manipulation of energies. That is dark forces. Only dark forces create reaction. It is doorway into the self. In that state the self embraces everything around you. For you these energies are transformed. It is transmitted through sacred thoughts. Sacred thoughts are thoughts that are willing to see things for what they are without manipulating them to comply to any other thought process. It is the allowance of the truth to present itself that activates Shaktipat. My first experience of Shaktipat energy was alone with a book that I was completely immersed in. That energy was beyond description, that is scared me. It was inside me and around me. It took me years to accept it and to realise the divine energy I was privileged to be a part of. Then that set me on a path to exploring different Shaktipat energies. They access different levels of consciousness. To do that - there need to be different frequencies to penetrate the walls and resistances that have built up over the years and the many lifetimes of misinformation and misunderstanding. These beings told here she entered a new grid of consciousness. When you spend time with a surf lifesaver, you would naturally become aware of ocean conditions. When you take time to be with a sailor, you'll learn which direction to take to your destination. Purely by reading the ocean. Sailing conditions become a natural instinct much like walking. You'll navigate your way around obstacles or remove the as you walk. The same in Shaktipat. It's there in everyone, just like elements of the ocean are all there, but you cannot see all of them. Sometimes you need to go snorkelling or deep sea diving to appreciate the beauty the ocean holds. Your body is an ocean calling for you to explore it. When you know your body better you are more likely to care for it differently. As we get to know the living beings in the ocean we appreciate the ocean itself. As you begin to feel different flows and currents that deliver messages directly to you, you treat your body differently. You own body has its own manual. Shaktipat has the capacity to open you awareness within your own body. In the videos participants share their experiences of healing through Shaktipat. You may feel you've had heart surgery that opens you to new realisations. Or weight lifted (as this participant describes) that you did not know you were carrying until it is no longer there. Direct guidance is essential at that time or you are likely to go into human animalistic reaction. 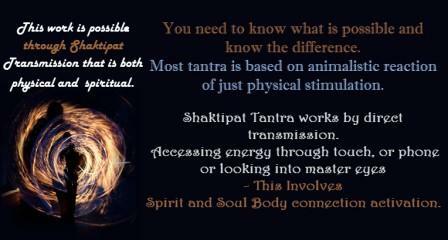 As result of Shaktipat transmission you are able to feel more uplifted and vibrant. Answers you always had can come spontaneously and simultaneously. You'll know who your true friends are. How much you may have neglected yourself purely through lack of knowledge of your own spirit and soul who are part of your life on earth. You spirit and soul are here right here and now. You do not need to pass over to meet with them. You are your soul, spirit and body combined right now. But mostly you are not aware of them. This video a man shares how his healing happened from inside out. Like gentle internal acupuncture. In this video he explains his experience of self healing. Shaktipat as it opens can give you energy to stay with your resolutions. .
As a result you become more present and available to your family, friends and work place. Communication improves between you and people around you. In this video; a participant describes the energy entering his body through the head as it wrapped itself around him. Simultaneously he felt his body immersed in it. It was around him and inside of him. Your soul surrounds your body. You live inside your own soul. Most people would never even consider that. The live blissfully in divided state - separate from their own soul. spirit lives inside and outside of you - that is often felt and finally acknowledged. When you feel it - you begin to live it. Shaktipat is foundation of all life energies. Shaktipat brings awareness to inner wisdom. When in the space of Shaktipat time stops still. Your life becomes timeless. There can be no stress in that state. This connects you to your higher purpose. It is unconditional. You can live life where you are at work and in personal relationships. The difference is that because you are in universal flow, there is not stress. The reason is that you are connecting to what is already there within you. When separation ceases, you are one. It is only in separation do you feel stress because there is no recognition of all elements that link the within with the without. Understanding the difference between chi and Shaktipat. Some people confuse that with Reiki. There is absolutely no relationship to Reiki. Shaktipat needs to be experienced purely, not mixed with new age interpretations. It is not Chi or even Prana. Shaktipat is the grace of divine energy. There is no devotion. When we mix that with devotion, you divide the source. In the end it is not dependent of a guru or on therapist. It does take a guru or a skilled therapist who has been through it themselves. There are pitfalls in going it alone because you are likely to misinterpret the energies and run from them because they immerse all of your completely. This feeling comes from within and merges with the energies without. Most people have never felt this much connection to all consciousness. The whole body feels like you have lost yourself into everything. But that everything is the all of you. It is important to know that there are levels of immersion. One can believe they have reached nirvana. But that is just one step forward. You can fool yourself accepting the illusion of believing you experience all there is. For this reason you need guidance until you are able to recognise that yourself. This is first step of burning up the ignorance that has been part of your life for most of your life. Some end up experiencing the void, that is a way of avoiding the bliss and self realisation. We need to move on to a different state and activate a different aspect of you. This is where you need guidance so you do not settle for just a beautiful feeling. You can receive Shaktipat from across the world, over the phone or even connecting to a certain aspect of nature. The key is to recognise what is happening to ensure you do not get caught up in the illusion of what your normal state of mind explains away. At this point it's essential to understand that you do not become compliant to everyone's desires. Far from it. You become your own master. You will however be able to manage any generic interference from limited mindset's of the average persons ignorance of what is possible. Shaktipat is the living intelligence that is embedded within your cells. It is said that it is within the universal energies. We are immersed within the universal energies, therefore it is within us as well. When you are in the experience of Shaktipat all of you automatically rearranges itself into the to perfection. Every atom settles in it's designated position. The key is to keep the mind out of the equation or it will have a tendency to take over and control the process. Remember - it is not chi or Prana. The mind always wants to degrade experiences by labelling. The moment you label anything, you trap it within your perception of what that label represents. Labels are limitations. Really listen to what people have experienced and how they feel lost for words because they stepped outside the realm of the known into unknown feelings. New feelings do not have recognisable labels. Therefore I assist people in describing their experience by feelings not labels. By some this is described as specific meditation. My experience is that meditation is a state of conscious beingness all day every day. The meditations often spoken of tend to be ones that isolate the participant from the normal world. There is higher meditation that revolves around participating in the world without judging it. Without an opinion. Highest level of meditation is being aware of life precisely as it is. Letting it be as it is as you continue to live life on your level of preference. You walk your truth. As you walk in your truth the negative things that you see do not affect you. Life in some areas is like a hornets nest. When you know where the hornet nest is located, you do not go there. You do not disturb the nest that is likely to attack you in order to protect itself. You keep your distance. They will not invade you providing you do not invade them. That is the power of walking and living meditation. Meditation is really living in a heightened state of consciousness.